I'm glad I already had Wellies on hand. 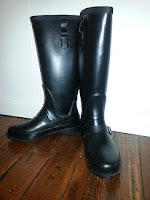 These tall, rubber boots are perfect for tromping through the high grass in the fields and along the cliffs of Cornwall, and later, Scotland. And thank goodness for my wind-proof coat with the hood, and the thick, red alpaca-wool scarf and gloves. I'll be sure to stay warm and dry, won't I, while on this excursion? I'm grateful too, for the variety of tea bags in my cupboard, and the tea kettle's merry whistle each time I prepare a cup. The truth is, I've been in my apartment almost constantly, for several days, alternately blowing my nose, sleeping, and drinking plenty of fluids. My constant companion? Rosamunde Pilcher and Winter Solstice. I wanted to re-read it this year, and the day after Thanksgiving, I didn't feel up to accomplishing much else. You probably realize now that the outdoor things weren't needed in reality, just in my mind, as I vicariously traversed a bit of the world I've never visited in person. But I can dream, and a good book is a huge help. I hope you find a book that takes you where you want to go this season. Is there a part of the world you especially like to visit by reading? 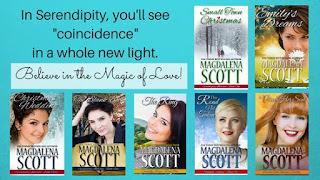 Magdalena Scott is a USA Today Bestselling Author of small town romance and women's fiction. Her most recent releases are books 6 and 7 of the Serendipity, Indiana Series. What a lovely post! Like you, that's one of the reasons I love books so much. They can take us anywhere. Yes, books are amazing that way. Thank you for reading the blog, Josie. Have a great day! The far east. The culture is so different. Sounds exciting, Merrillee. Do you have a favorite author who writes about the far east? Get well soon! Enjoyed the post but I'd rather you weren't sick. Hope you kick the cold soon. Small town stories are my favorites because I live in the crowded suburbs.